* SPECIAL EASTER OFFER * Single accommodation at shared price for the first three people to book! Join Ebru for this special springtime retreat at beautiful Huzur Vadisi. Warm sunshine, fields of camomile, irises and poppies, a wonderful boat excursion on Turkey’s Turquoise coast included, mountain and forest walks with beautiful views – the perfect restorative break. All levels of ability are welcome. Along with an explosion of awareness of Yoga’s health benefits to a much wider Western audience came the challenge of preventing injury. By blending a scientific Polestar Pilates qualified training into Yoga and Pilates classes, Ebru discovered the chances of injury could be minimised and health benefits maximised. Her passion is in the study of the balance between the physical, mental and spiritual aspects of the human body as it relates to everyday modern lives. 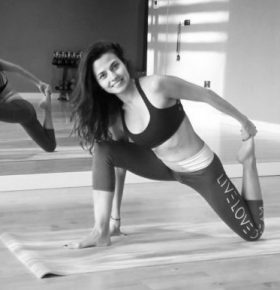 Drawing on the disciplines of Ashtanga Vinyasa , Vinyasa, and Restorative yoga, Ebru likes to motivate her students to improve flexibility, mobility, strengthen muscles, calm the mind, and generally deal with the stress of modern life. Her aim is to help her clients develop and grow in their own unique way off this solid platform. What you put in is what you get out. She believes that if we find self-discipline and spiritual awareness, we can identify and sideline whatever limits us internally and reach our full potential externally. She brings to her classes, courses, retreats and social media a positive energy that touches as many lives in a beneficial way as possible; which helps us all find a tailor made balance in modern life that works best for each of us. From 2000 Ebru practiced classical Pilates and meditative Raj yoga at Brahma Kumaris in Istanbul to help deal with the stresses and strains of an early career in pathology, digital advertising, marketing and design. In 2016 she completed a 200hr intensive teacher training course in Ashtanga Vinyasa/Hatha Yoga with Lalit Kumar at the Himalaya Yoga Valley in Goa, India, and is currently building on her classical Pilates experience by taking a 2 year scientific Polestar Pilates teacher training course in Leeds with Claire Sparrow. She regularly attends short courses and seminars to add to her skill set, like Relax and Renew restorative teacher training with Judith Lasater, who did extensive study with B. K. S. Iyengar in India and the United States.